Dr. Pasquale “Pat” Ciaglia became a physician inventor late in his career. However, this late start didn’t stop him from developing several important products to improve patient care. The most notable one was the Ciaglia Blue Rhino® Percutaneous Tracheostomy Introducer in 1996, the one you see being made in the video below. We were lucky to have worked with Dr. Ciaglia on developing his products. In the summer of 2014, we learned that Cook Medical had shipped the millionth unit of the Ciaglia Blue Rhino Percutaneous Tracheostomy Introducer. This milestone came as a bit of a surprise to Cook; this procedure was slow to catch on with physicians at first. The first PDT product was a set of seven serial dilators that used an angled, tapered tip to accommodate the anatomy of a trachea. Dr. Ciaglia was concerned with the number of complications patients experienced using a surgical (or open) tracheostomy technique. He knew that there had to be a better way. At St. Elizabeth Medical Center in Utica, NY, Dr. Ciaglia happened to see a colleague performing a percutaneous kidney stone removal procedure with a set of straight serial dilators, the Amplatz Renal Dilator Set. This device used a minimally invasive, over-the-wire, Seldinger technique to access the kidney. Realizing that the same principle of using sequentially larger dilators could be used for tracheostomy, Dr. Ciaglia wanted a closer look at those renal dilators. As good fortune would have it, the Cook sales representative for the hospital happened to be supporting the procedure that day. Dr. Ciaglia worked with Cook to modify the renal dilator set to better accommodate the anatomy of a trachea. 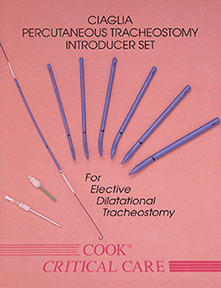 The first percutaneous dilational tracheostomy (PDT) set was launched in 1987. The first Ciaglia Percutaneous Tracheostomy Introducer Set changed an open surgical technique into a minimally invasive one. After he became comfortable with the new tracheostomy dilator set in the operating room, Dr. Ciaglia sought to move this procedure to the bedside in the ICU, which was unheard of at the time. Early adopters of bedside PDT were few and far between. One of our sales representatives at the time recounted being laughed out of physicians’ offices after being told it would never happen. It took about a decade of using the seven-dilator set for PDT to catch on, but Dr. Ciaglia was already busy improving the procedure. He thought: Why use seven dilators when you can use one? He found inspiration in the dilators he saw in nature, including tusked animals like walruses and elephants. This realization was the inspiration for a single, graduated dilator that could dilate the tracheal tissue in one pass. And so, the Blue Rhino was born. Dr. Ciaglia’s passion for using PDT to improve patient care assured us that we needed to pursue the graduated dilator. Despite the slow early adoption of the procedure, performing PDT with the Blue Rhino at the bedside is now the standard of care in many hospitals around the world. Because there are areas of the world where the adoption of PDT is still in the early stages, we maintain Dr. Ciaglia’s passion for this procedure and continue to train clinicians on the technique at new locations. Dr. Ciaglia began inventing medical products toward the end his career as a thoracic surgeon. When he began working with Cook on the serial dilator project, he forged strong relationships with the engineers and product development team. 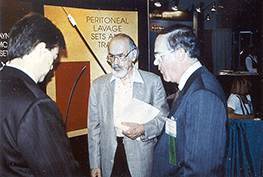 If Cook was exhibiting at a medical meeting, Dr. Ciaglia (center) and his wife would have their own booth to show physicians the PDT procedure. “There was a time when my phone would ring every morning at 8 am and I knew it would be Dr. Ciaglia. Even without caller ID, I knew it was him. And every morning, he would ask, ‘What are we working on today?’” said Frank, an engineer at Cook. “He really believed in the Blue Rhino and would carry one in his pocket just in case somebody asked him about it,” said Bruce, who worked in the Cook Critical Care specialty during the development of PDT. Dr. Ciaglia’s wife, Jacqueline, was very supportive of the work he did. She would accompany him to medical meetings and help him demonstrate his products and teach physicians his technique. If Cook was exhibiting at a medical meeting, Dr.Ciaglia and his wife would have their own booth to show physicians the PDT procedure. While Dr. Ciaglia was passionate about helping his patients, there was one thing he loved more: his family. Dr. Ciaglia served in France during WWII, and it was there that he met and married Jacqueline. A fellow soldier and physician, Dr. Cesare Gianturco, served as best man at the wedding. Coincidentally, Dr. Gianturco also later developed products with Cook for embolization, vascular stenting, and the prevention of life-threatening blood clots. 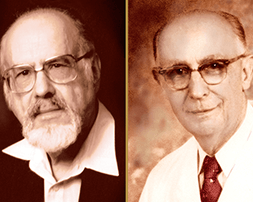 Dr. Ciaglia and Dr. Gianturco served in WWII together, stood up as best man at each other’s weddings, and both invented medical devices with Cook. After the war, the two physicians lost touch. Many years later, during a visit to Cook headquarters, Dr. Ciaglia recognized a picture of Dr. Gianturco, which prompted a discussion regarding their unique friendship. Neither were aware that the other had been working with Cook. This led to organizing a surprise meeting between the two at a medical meeting nearly 50 years after Dr. Ciaglia and Jacqueline’s wedding. Inside and outside of the hospital, Dr. Ciaglia was known as a man of passion and compassion. Toward the end of his life, he wrote his own “obitulogy” including an excerpt below. Although the millionth-plus Blue Rhino has already traveled along the production line, we reflect back on the milestones Dr. Ciaglia achieved. We want to say “thank you” to a man who revolutionized patient care. Today, we are honoring the good doctor’s vision by helping more patients every day. Join the conversation on Twitter using #PercTrach. Have an idea for a product? Cook can help make it a reality. Submit your idea today!